We better get straight to it. It’s rare that a film assaults your emotions and state of mind as effectively as Damien Chazelle’s ‘Whiplash’, but what Chazelle has created here with his sophomore effort is a film that hits you so hard for so long that you feel like an emotional wreck cowering in the corner, gripped and tense, powerless to resist the uncompromising power of almost every scene, each one more intense than the last. 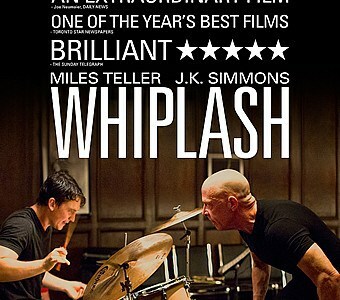 For a film about a jazz drummer trying to do well at university, ‘Whiplash’ brings a lot of game to the table, thanks in no small part to brilliant performances from Miles Teller and JK Simmons, whose interactions sizzle and pop with relentless vigour and whose line deliveries are always perfect. While Teller puts in the performance of his career so far, proving that there’s far more to him than playing an inconsequential character in the horrible ‘Divergent’, it’s Simmons that steals the show. He channels Sergeant Hartman and perhaps even a spot of Malcolm Tucker to play a toxic conductor by the name of Terence Fletcher who is based loosely on an old music teacher of Chazelle’s. He hounds his students with emotional and even physical abuse, though often with a darkly humorous turn of phrase that has you laughing and cringing at the same time. It’s a truly ferocious performance, and the give and take between his character and Teller’s Andrew is so engrossing it’s barely even possible to blink as your eyes soak in every millimetre of the screen. 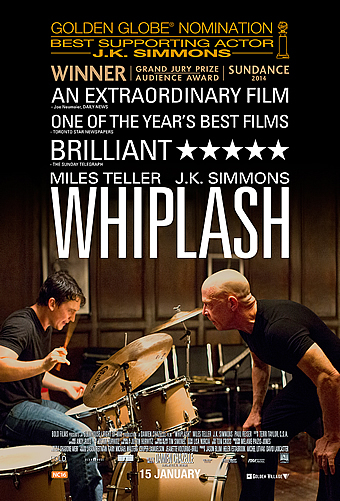 Sure, ‘Whiplash’ is ostensibly a film about drumming. More importantly though, it’s a film about endurance, human endeavour and even the willingness to go on in hardship, bearing many of the same qualities as a war film might, so thunderous is its delivery. Every hit of the drum becomes more and more painful for Andrew, but this is the sort of sacrifice that Fletcher thinks is necessary to become truly great, the relation between pain and greatness apparently one that rises exponentially but comes at a great cost. It’s undoubtedly clear that Fletcher’s treatment of his charges is unacceptable, but his brand of logic at least gives you something to think about and further proves that Chazelle’s film is a clever and intricate character study that addresses the imperfections of its characters as much as it looks at the idea of mastering an instrument. The drumming sequences are visually stunning and the intensity of it means that while we spend long stretches of time watching Andrew drum, it’s anything but boring as you are gripped and watching every beat, staring in wonder and repulsion at the level of hurt he is causing himself, hands bleeding with the effort. Chazelle makes sure these scenes have the necessary power and brings it to a crescendo with a hugely satisfying third act that sends you on a rollercoaster of despair and unfliching tension, making every moment of release worth it. Beautifully made and fantastically acted, never has a film about music been so much like watching a conflict as it makes sure it batters you with a sledgehammer of swirling emotions for its entire two hour runtime. ‘Whiplash’ is fully deserving of all the recognition it has received, but will do more to dissuade would be jazz drummers than to encourage them, such is the mental trauma of the film. A perfect example of how to make an excellent thriller with very few tools, this is the sort of feat that indicates Chazelle will go far, and he most definitely deserves to.